Close your eyes and imagine eating vibrant, delicious mangoes while taking in the sights and sounds of Waikiki. Sound like a sweet experience? It can be yours when you visit the seventh annual Mangoes at the Moana Event at the Moana Surfider, A Westin Resort and Spa. On Saturday, July 18th, mangoes make their return to the hotel’s Banyon Courtyard from 9 a.m. to 4 p.m. The daylong celebration of one of Hawaii’s favorite summer fruits features seminars, workshops, demonstrations, a farmers’ market, the Best Mango Contest, and the Mango Throw Down—the ultra-popular showdown between top island chefs. Best Mango Contest, 9 a.m.
Mango lovers and growers are welcome to submit two homegrown backyard mangoes for a chance to win “Best Mango of the Year.” A panel of judges will be determining which mango will have the best flavor, skin, flesh, and aroma texture. The grand prize is a two-night stay in an ocean front room at the Moana Surfrider, A Westin Resort & Spa. Registration for the contest is for an hour only, and begins at 8 a.m.
Hawaii’s mango farmers share a taste of the varieties of mangoes that are grown on their farms in this “talk story session” with the farmers, who’ll share an in-depth view of how they raise their trees to produce a world-class product and an opportunity to purchase fresh ripe mangoes. Beginning at 11 a.m. that day, there’ll be a silent auction from which proceeds will benefit the Culinary Institute of the Pacific at Kapiolani Community College. 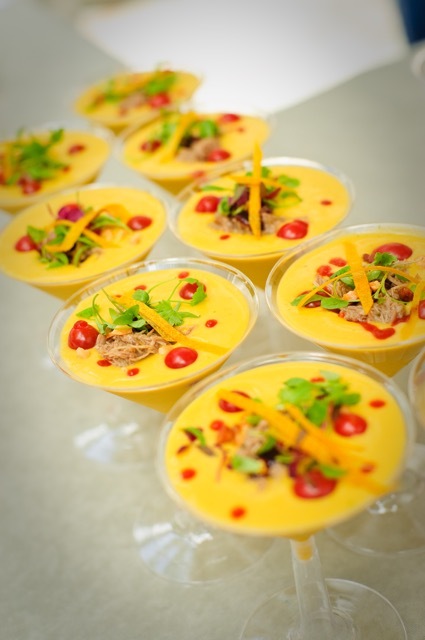 Guests can also learn how to make several mango-inspired dishes at cooking demonstrations by Executive Pastry Chef Nanako Perez-Nava. She’ll be demonstrating how to make mango scones and mango curd at the Ewa Veranda at 1 p.m., while at 2:30 p.m., she’ll show guests how to make a variety of summer mango dishes such as mango panna cotta and spiced mango compote. Mango Throw Down, noon – 4 p.m. This annual friendly cooking competition will feature eight local celebrity chefs preparing creative dishes featuring mango as the main ingredient. Admission is free and guests are welcome to taste each chef’s creation for $6 per plate. There will be a ticket pre-sale for those who are interested in purchasing prior to the event. The “Mango Cocktail Mixdown” features impromptu mixology sessions that will allow guests to purchase cocktails at the booth as well as participate and learn of the featured cocktails at the event. Guests can use their tickets from the Mango Throw Down for the Cocktail Mixdown. Mango cocktails and creations are popular items at the event. Mango 101: Introduction to Mangoes at 2 p.m. Guests are invited to learn about different varieties of mango grown in Hawaii and each mango’s unique texture and aroma. Experts will share best practices in growing a healthy fruit-bearing mango tree, pruning techniques, production, how to maintain a tree, prevention disease, and other relevant information on the care of mango growing. 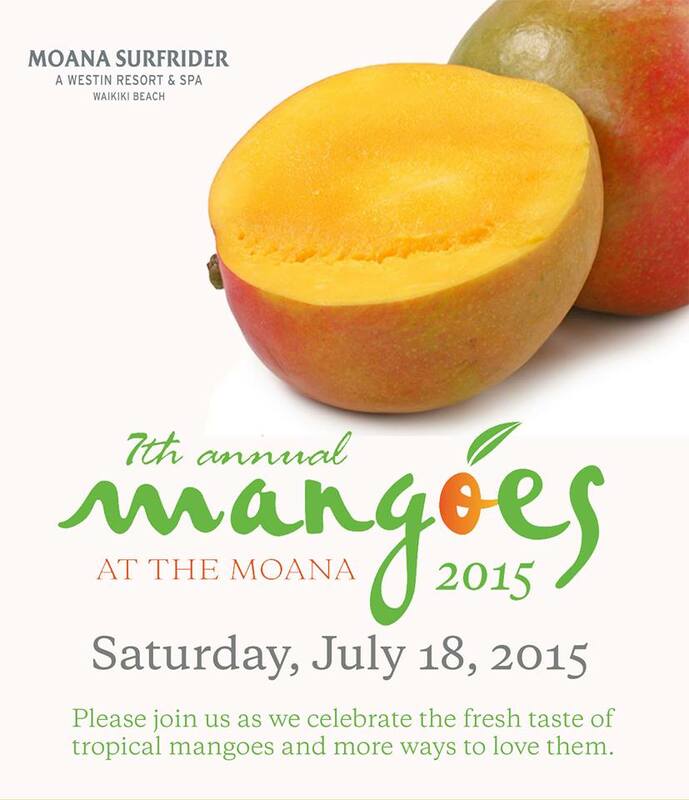 For information about the “Mangoes at the Moana” festivities, please call the Moana Surfrider at 808-922-3111 and ask for the concierge desk. For dining reservations or information, please call the Starwood Waikiki dining desk at 808-921-4600. Self-parking is available at the Sheraton Princess Kaiulani and is complimentary for four hours with validation. Validation given at the Mangoes at the Moana event with ticket purchase.